These Chandra images provide the first complete census of compact binary stars in the core of the globular cluster known as 47 Tucanae. 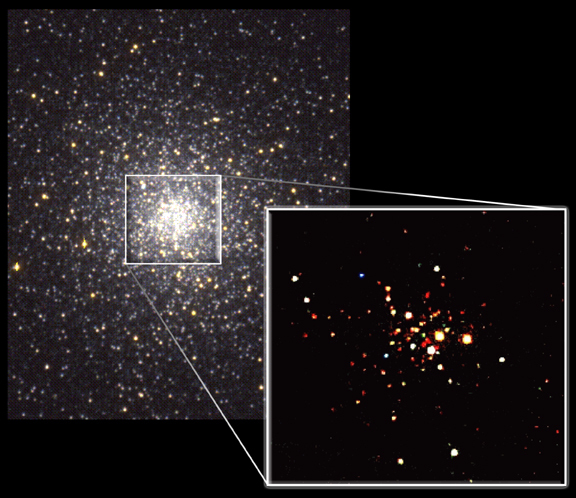 As the oldest stellar systems in the Milky Way Galaxy, globular clusters are laboratories for stellar and dynamical evolution. Nearly all objects in the Chandra images are "binary systems," in which a normal, Sun-like star companion orbits a collapsed star, either a white dwarf or neutron star. The data also reveal the presence of "millisecond pulsars" that rotate extremely rapidly, between 100 to nearly 1000 times a second. The relative numbers and components of the binary systems tell scientists about the formation and evolution of the globular cluster. In a region of the sky equivalent to 1/15th the diameter of the Full Moon, the Chandra image on the left shows over 100 X-ray sources, more than ten times found by previous X-ray satellites. Astronomers have long studied 47 Tucanae, but Chandra is the first X-ray satellite with enough the spatial resolution and sensitivity to detect all of these objects. 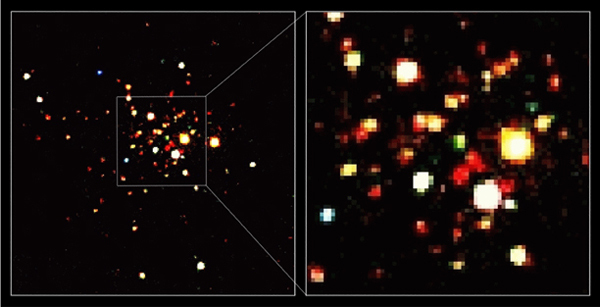 The image on the right is a blow-up view of the central region of the Chandra field to the left. The different colors in the Chandra image represent the dominant X-ray energy range for each source: low-energy X-ray emission (red sources), intermediate energy X-ray emission (green sources), and high-energy X-ray emission (blue sources). The white sources are bright in each energy range. The faint red sources are mostly millisecond pulsars, while the bright white sources are mostly binaries containing white dwarfs pulling matter off normal stars. The two blue sources are also binaries containing white dwarfs. Pairs of normal stars that have undergone large flares induced by their close proximity are shown as objects with a mixture of red and white. Scale Image is 2 arcmin across. Coordinates (J2000) RA 00h 24m 42.0s | Dec -72° 00´ 00"